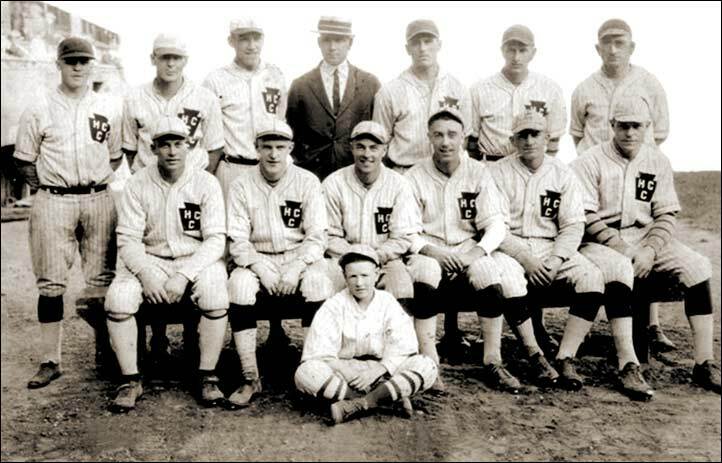 Only a couple of IDs so far - outfielder Harry Butler is second from the left in the top row and the "suit" is Doan Hartnell whose family owned the Hammond Cedar Mill. In 1924, Hammond went on to win the B.C. title by defeating the Young Liberals and Victoria C.P.R.. Hammond then defeated a highly touted Calgary team in straight games and was all set for the Canadian national finals when snow stopped the playoff series. Hammond had an incredible 1924 season defeating the Young Liberals and Victoria C.P.R. before tackling and defeating a highly-touted team from Calgary. There was hope of a Canadian national final but it did not materialize. Even more impressive, the 1924 Cedars won playoff series from Fraser Cafe of New Westminster, the Terminal League champion Vancouver Engineering Works and the Delta League pennant-winners from Cloverdale before knocking off the three aforementioned teams. In total, six straight playoff series.